President Barack Obama marked his final Memorial Day as president with a series of events honoring the sacrifices of those in our military. On Sunday night, a free Memorial Day concert was held on the west lawn of the U.S. Capitol, headlined by The Beach Boys. On Monday morning, Obama hosted a breakfast for military and veteran service groups, as well as senior military leaders, at the White House. 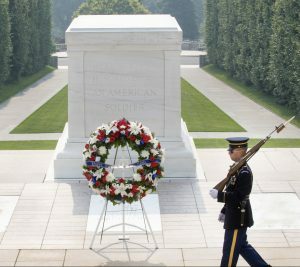 The president then went to pay tribute to fallen U.S. soldiers at Arlington National Cemetery and lay a wreath at the cemetery’s Tomb of the Unknown Soldier. He was joined at the ceremony by the country’s top military brass, including Chairman of the Joint Chiefs of Staff Gen. Joseph Dunford and Defense Secretary Ashton Carter. Families and friends of fallen soldiers began gathering early at the cemetery to pay tribute to their loved ones. Memorial Day honors men and women who died while serving in the U.S. military. The first large-scale observance of the holiday, originally called Decoration Day, took place at Arlington Cemetery in 1868. Since then, the holiday is seen as the unofficial start of the summer vacation season, with many businesses offering employees a three-day weekend. The Memorial Day is especially poignant because many U.S. military members are still engaged in dangerous efforts across the Middle East. Nearly 10,000 U.S. service members are stationed in Afghanistan, and more than 4,000 American troops are in Iraq and Syria participating in the anti-ISIS effort. More than 20 U.S. troops have been killed in Afghanistan in the past year and three others have been killed in Iraq. Earlier this month, 31-year-old Navy SEAL Charles Keating IV was killed in a firefight with ISIS fighters. In his speech at Arlington National Cemetery, President Obama called on Americans to do more for those who served their country and the families left behind. Veterans’ issues have emerged as a major factor in the presidential campaign this year. A long stream of errors under the Obama administration has led to increasing criticism of its handling of veterans’ benefits. In recent weeks, the Department of Veterans Affairs has admitted to cutting off benefits for thousands of veterans who were incorrectly declared dead, with the errors occurring from 2011-2015. An investigation by Government Accountability Office study found last month that the VA still hasn’t corrected its failures with chronic delays in wait times. The investigation also found that VA employees have continued to provide misleading data to the public about the delays.